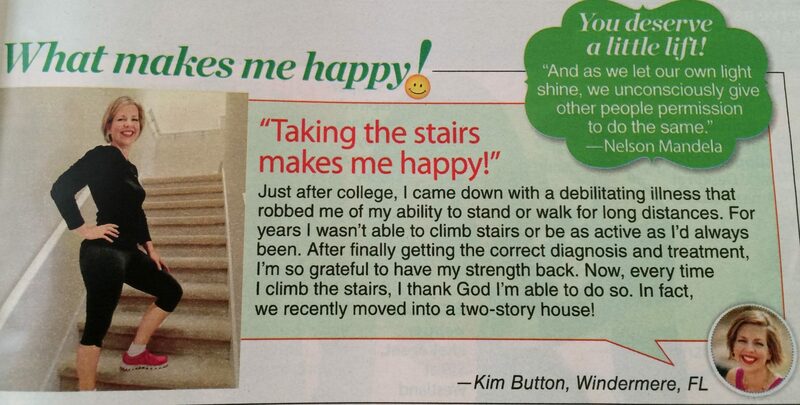 Kim Is Featured In Woman’s World Magazine! I started GetGreenBeWell.com after being disabled for years by mysterious illnesses that doctor’s couldn’t figure out. Part of my health problems were that I could no longer walk up stairs, much less walk long distances, at all. 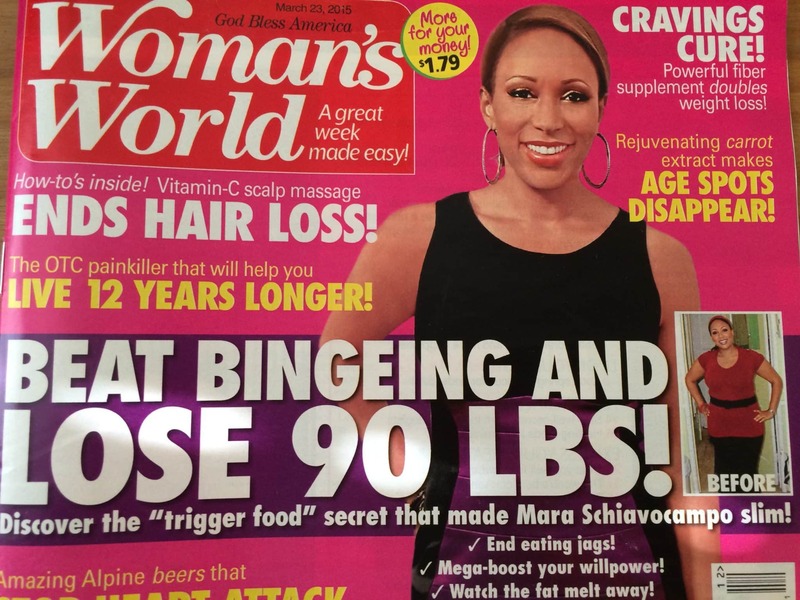 So, I’m thrilled to have made a recovery, and am featured in Woman’s World magazine this week because of turning my health around! Cleaning up my home, diet and lifestyle were a big key to helping me recover. That’s why I wrote The Everything Guide to a Healthy Home. My faith in God was a huge component of my healing, and he brought me to the right doctor at the right time in Orlando. One day I’ll write about my steps to recovery, including the use of Advanced Activator Technique chiropractic methods to regain use of my legs and heal my Fibromyalgia and Chronic Fatigue Syndrome, but I’m already getting so many inquiries online from my appearance in Woman’s World this week that I wanted to let you know what my recovery involved. Oh my!! What a great story!! Still so much to learn about you!! Love it.. And love that God led you to the right doctors!! Such a great story. Will have to look for the magazine!! Watch for an email from me soon! I’ve had so many inquiries into my health, that I’m responding to everyone with one email. My sister read your article. Having same symptoms as you and more. Lost job back in the fall. Will go to Emory in Atlanta in May. She is 39 years old and unable to drive etc. Been to doctors, emergency rooms, test, test, test. Think it may be lupus. Has definite RA. Can she talk to you? Thank you. I don’t know what Kim will suggest but I have some ideas for your sister. Has she tested for lyme disease? Not the tests they have at the doctor’s office but from a company called IGeneX. You can order the test kits from them directly. They are the gold standard for lyme and it’s co-infections. Call 800-832-3200. If she has lyme you will want to make sure to find an LLMD (lyme literate medical doctor). Check to see if she has an oxalate problem. That test is the Great Plains OAT (organic acids test) and you can google info on oxalates and/or read about them on the Great Plains website. Has she checked her gene profile? Go to mthfr.net for info on the MTHFR polymorphisms (defects) and more. Also, go to the Stop The Thyroid Madness website and see about thyroid and adrenal problems. Even if a doctor has told her that her thyroid is fine it may not be. Check out info on the Paleo diet which is a good place to get started if she suspects an autoimmune disorder which is what lupus is. The gut is a primary place to look and a starting place for many illnesses. Order Genova’s GI Effects stool test which will give her lots of info on the health of her gut. Has she taken a lot of antibiotics? This could compromise her gut. Finally, does she know if she has been exposed to mold? I would make sure to buy Kim Button’s book on eliminating toxins from the home. She has been there and done that and it worked for her. I am so sorry for your sister and there is always more hope that it seems. Just remembered something else. Check out mitralvalveprolapse.com and mvprolapse.com and see if her symptoms look familiar. Dr. Phillip Watkins at the MVP Center in Birmingham, AL can help you. Even if you were told you don’t have mitral valve prolapse, if your sister’s symptoms look familiar she should make an appointment and go there. MVP/dysautonomia can make some people miserable.